A mere week after starting our oyster mushroom propagation experiment, the fungus has already taken hold. 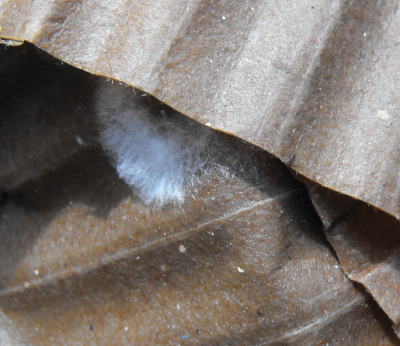 Its mycelium is running across the damp cardboard and even growing up through the cardboard to the next layer. As oyster mushrooms ripen on our mushroom logs, I've been cutting off the stem butts and putting them between new layers of wet cardboard in my flower pot. I hope that in a few weeks, the pot will be chock full of mycelia. Then I can use the mycelia to seed new containers of damp cardboard, eventually growing enough to innoculate a bunch of new logs in the spring. No more paying top dollar for mushroom plugs! Looking for a fun DIY project? Make a homemade chicken waterer.